When your business can soon produce a continuous stream of sales, leads, and referrals that deliver record-breaking growth, all for less time and less money than you invest right now! The Predictable Super Growth Blueprint takes you from start-up to success… or from uncertain seesaw sales to a rock solid self-supporting business. It's time you re-think the results you expect from your current or future business. While most businesses today seem content in growing by 2%, 3%, or 5% a year, some in-the-know business owners are essentially reshaping their business each and every year — growing by 20%, 30%, 50% and MORE! Consider these companies that Forbes magazine has listed as America’s Fastest-Growing Tech Companies. Each has achieved exceptional sales growth over the past three years. Grubhub has seen a three-year average sales growth of 66%, Aresta Networks averaged 63%, and Veeva Systems averaged 47%. These are just a few of the outstanding companies booming in today’s economy. I know firsthand that people all over the world are seeing blockbuster sales, revenue, and profits. So how are these businesses experiencing exponential growth while the rest of the world works like mad to squeeze out a 2% gain — or just break even? Do they have the world's greatest products and services? Not necessarily. Do they employ the world's smartest business people? Nope. The answer lies in four simple words that any business — including yours — can introduce and start realizing extraordinary results. FAST! Those four words: Predictable Super Growth Systems. With the right Predictable Super Growth Systems in place, your business runs FASTER, MORE EFFICIENT, and MORE PROFITABLE than ever before. You power up your computer. With a few clicks, the performance of your entire business stares back at you. 38 more online leads since this morning. Not bad. And 17 referrals from your best customers. Free business! Social media has netted $80,000 in new business since Monday. And your sales and promotion funnel has 640 new customers for the week. Sales are up… HUGE! 20% higher than last month. 40% higher than last year. With a couple more clicks, you see all marketing, lead generation, social media, and referral systems are working perfectly. No touch, no fuss. You shut down the computer. After all, you're the business owner. And you're on vacation at a tropical beach with your family for two weeks… all while your business continues to rake in more profits than ever before. This isn't dream expectations or hyperbole. By implementing a few simple Super Growth Systems in their businesses, people are transforming their businesses into rewarding, profitable, sales machines. Most businesses today run like a Greyhound bus. You slowly start heading to your first goal. Then you stop. And have to start again — often in an entirely different direction. Maybe you create a marketing campaign that generates leads. You roll along, but when the leads dry up, you stop. Then you scramble to create another campaign to bring in more leads. Start, stop. Start, stop. The net result: Average sales… costly marketing budgets… valuable time wasted. Not to mention never-ending stress by wondering if you will make your sales numbers this month, next month… EVERY month. Then, there's today's NEW breed of business — the Eurail High Speed Train that covers great distances at breakneck speeds of 155 miles per hour! Businesses that run Predictable Super Growth Systems operate with this kind of speed, efficiency, and results. Because there's no stopping and starting… because there's little expense and less time demands… because you simply set it, forget it, and watch the impressive leads, sales, and profits roll in… this new breed of business is re-defining expectations and business growth. The day you flip the switch to activate your Predictable Super Growth Systems, your business will never be the same. You'll suddenly gain a crystal clear picture of where your business is now and where it's soon headed. LEAD GENERATION: Stop chasing leads… Clients and customers line up to buy from you thanks to magnetic lead generation systems that work 24/7. MAXIMUM REFERRALS: Your customers become your best salespeople… Continually bringing more qualified prospects right to your business. EFFECTIVE SALES FUNNEL: Add exponentially more profits to your bottom line with a predictable system that turns prospects into repeat customers. PASSIVE INCOME: Once you set up your systems, your marketing will bring in money whether you're working or not… for LIFE! My name is Fabrice Beillard. My clients often refer to me as an internationally acclaimed entrepreneur, business coach, speaker, author, and corporate trainer. But I see myself as just an average guy with a perpetual passion for marketing, sales, and business. Through that passion, I've spent decades testing every new marketing and sales strategy I came across. As a result of learning what truly drives business growth (and what rarely works), I began to apply my most proven tactics to my own business. In less than 12 months — on a very limited marketing budget — I was able to create enough passive income to retire with my first business! But I didn't want to retire. Rather, I wanted to share what I learned with other business owners, managers, and entrepreneurs. As a result, I've had the privilege to analyze and improve many businesses around the globe, from start-ups to large multinational corporations. In fact, I was even fortunate to help grow a business from $2 million in revenue to about $40 million in just a few years — A 1900% INCREASE! Over the years, I've had the honor of sharing the stage with world-renowned speakers, such as Bill Walsh, Mark Victor Hansen, Gerry Roberts, and many more. Also, companies that endorse Richard Branson, Harv Eker, and other business and personal development leaders often promote my business-accelerating services as well. For the first time ever — but for a very limited time — I'm prepared to share my complete winning playbook in this home study video course available exclusively at Nightingale-Conant. In this video course, I'm handing you my top strategies, tactics, and systems that are most effective to grow your business. Announcing my most complete business-accelerating program: The Business Super Growth System: Where Your Dream Lifestyle & Passion Meet Extraordinary Wealth! In the 12 concise and practical DVDs, 4 Bonus Audio CDs, and Writable Workbooks and Business Templates contained in The Business Super Growth System, you'll have everything you need to enjoy sustained and predictable growth without having to add to your workload. "Hi, I am the owner of a Vintage Clothing ecommerce store… [Fabrice's course] has allowed me to set clear goals, and identify key areas of weakness and strength in my business. One month after the course, I have already achieved a 15% profit growth in sales." "If you don't know what your goals are, Fabrice will guide you the way forward. If you don't know how to achieve your goals, Fabrice will guide you to the straight pathway. So simple." "I wanted to write something amazing because you are, and the whole experience has been. I will just state some of my recent achievements: after attending a three day seminar with Fabrice, I was able to earn an extra $20,000 from my business within less then 7 days of completing the course. I have also achieved some major goals in less than one month that I had been waiting on for up to 5 years." "My business gets great results, starting with a threefold increase in my online traffic and a spike in inquiries. Thank you for your assistance Fabrice." Massively improve most businesses' profits… and mine! "[Fabrice] showed me some simple inexpensive ways to massively improve most businesses' profits — and mine, I consider myself a pretty savvy guy, Well, this guy nailed a couple points I thought I knew, but did not really realize to which extent they could really transform everything… all of you to benefit from that as well so you can get your business to the next level"
"What you told me that all of sudden clients will come. It is happening now and I am happier than a pig in mud." The real key to my clients' success, as well as my own, isn't in the strategies and secrets that we knew… it's what we DIDN'T KNOW — or did not have the right tools to apply and measure. Every day, I strive to learn more about how best to attract customers, generate leads, close sales, and grow my business. It is NOT full of theoretical concepts, philosophies, and "fluff". It is NOT a motivational course that energizes you to succeed in business. It is NOT designed to change your business without you making the effort. Everyone who has watched my Business Super Growth System home study video program is impressed with the volume of new ideas and proven business accelerators. The first couple of DVDs will give you the clearest picture of where your business — or soon-to-be business — stands now. As soon as you do the recommended exercises, you'll know what you can realistically expect for growth in the next few months to the next few years. This is the foundation for your business… it's critical to your future success. The next couple of DVDs will re-define how you communicate and attract future prospects and customers. Now it gets fun! This is where you create a marketing plan that runs automatically to promote your value to prospects and to bring customers right to you. Now you're ready to generate leads. I present today's most effective solutions to deliver a steady stream of qualified prospects to you, both online and offline. These DVDs alone can transform your business. But what good are leads and prospects if you can't turn them into customers. This next DVD focuses on the tools and strategies you need to SELL, SELL, SELL! Lastly, because it's all about the revenue, profits, and your income, I devote a couple of DVDs to ensure you know everything you need to know about finance and maintaining a profitable business. I even include Bonus Finance Templates! Yes! I want to experience record-breaking business growth by implementing Predictable Super Growth Systems and generating a continuous stream of sales, leads, and referrals — fast, cheap, and easily! 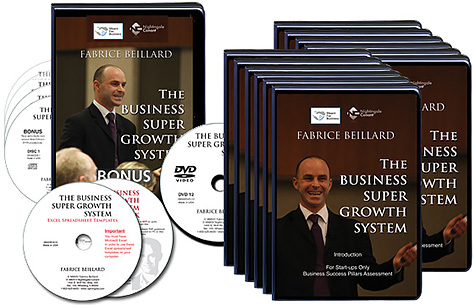 Please send me Fabrice Beillard's 12-DVD video home study program The Business Super Growth System, plus the 4 Bonus Audio CDs, Writable Workbooks, and Bonus Business Templates for the limited-time, low introductory price of ONLY $129.95 which is A FULL 85% SAVINGS — $770.00 OFF — the regular retail price of $899.95. GUARANTEE: If I'm not able to start changing my business, my sales, my profits, and my income in the next 30 days, I will return the program for a full refund. No questions asked. and accept our ZERO-RISK Guarantee. I'm constantly traveling from San Francisco to China to Australia and to Europe to conduct seminars where I reveal much of what I cover in The Business Super Growth System. How much do I charge for these events? Up to $2,500 in U.S. dollars! And yet, many are still willing to pay because they know they'll quickly recoup the costs when they implement what I teach them. Yet, there's just one of me. And there are many thousands of business owners who need to introduce Predictable Super Growth Systems in their business. So, I set out to make my home study DVD program accessible and affordable for everyone who wants it. 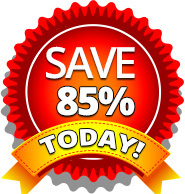 After evaluating all of the time and effort I put into this program, all of the years of learning the world's most effective marketing and business-enhancing systems, and after realizing all of the substantial value in this home study course (12 DVDs, 4 Bonus Audio CDs, and Writable Workbooks and Business Templates), I figured $899.95 was a very fair price. After all, these are the same business secrets I share with my highest paying clients who routinely — and gladly — pay $50K to work with me. But, in a meeting with Vic Conant, something changed. Because I've been fortunate to build a highly profitable business and achieve my desired level of wealth, I've come to a point in my life where money isn't as important. Affecting peoples' lives is more important. So, rather than selling this home study course at its real value — $899.95 — I decided that I wanted these ideas and this opportunity in the hands of as many business owners as possible. "How low do you want to go, Fabrice?" Vic asked me. "$699? $499? Maybe $299?" "$129.95. Yes, that's it! I want every business owner, every entrepreneur, and every sales and marketing manager to have the chance to impact his or her business like never before. Yes, $129.95!" Nightingale-Conant routinely gives their customers great discounts. But I don't believe they've ever come 85% OFF their retail price. Today they are — But, I'm told it can't last long. The price for The Business Super Growth System will increase sharply soon. Rest assured, you can return The Business Super Growth System anytime and for any reason within 30 days for a full refund. No questions asked! No longer have to chase new leads, prospects, and customers… because they'll be calling, emailing, and ordering from you. No longer have to wonder what your revenue and profits will be tomorrow, next week, and next month… because you'll have the clearest picture of your business and its expectations. No longer jump from one subpar marketing campaign to another… because you'll have the systems that generate business 24/7. No longer have to work long hours, sacrifice weekends and holidays… because your systems will ensure you can have the freedom to excel in your personal life as well. Start building the business of your dreams! 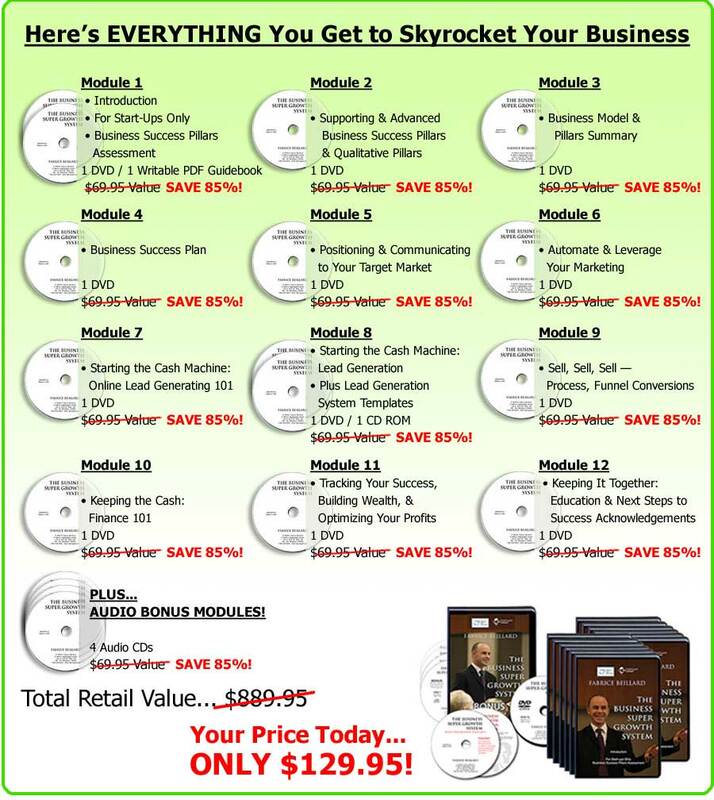 Go ahead and order the multi-DVD, multi-CD, and multi-workbook home study program: The Business Super Growth System. There's zero risk. Do yourself and your loved ones a favor. This is a program valued at $899.95 being offered at a low introductory price of just $129.95 — A FULL 85% OFF! You already know you will get the same results by operating your business as you always have. Why not try something different. Something new and bold. And transform your results! P.S. This offer will not be around forever, and this introductory price will increase very soon. The keys to your new profitable, low-stress and highly efficient business are in your hands. All it takes is one click to get you started in building the business that rewards you with a celebrity lifestyle. Order today and change your business in the coming weeks, months, and years! In accordance with the latest FTC guidelines, we want to make it explicitly clear that the customer letters and comments we have received are based on their unique experiences and circumstances, and the number or examples we use are purely for illustration and imagination. We cannot promise that you will experience similar results from using our product.